A showstopping challah bread with a za’atar spiced filling baked around a ceramic dish, which holds the dip! These Za’atar Bread Rolls make for a perfect centerpiece for the dinner table. This beautiful challah bread centerpiece comes from my all time favourite Great British Bake Off contestant Kimberley Wilson and her Peace Bread, which was her showstopper bake for bread week! Imagine buttery bread rolls filled with a fragrant mix of Roasted Red Bell Pepper and Garlic! I added some sunflower seeds as I really love the slight crunch and nutty aroma they add to the bread!! The filling is seasoned with za’atar, which lends the bread a middle eastern touch. The za’atar bread rolls are crispy on the outside but the dough inside is incredibly soft and rich. Almost like a brioche. Instead of butter, Kimberley used olive oil in her dough and so did I. It turned out incredible and was surprisingly easy to work with after the first proof. For the first kneading, you really want to use your kitchenaid as it gets rather sticky! The filling consists of a mix of pan fried onions, garlic, red bell pepper and some mixed seeds. I opted for sunflower seeds plus the sesame seeds, which form part of the za’atar mixture. The arabic touch comes from the added za’atar spice, which is a mix of several herbs and seeds. I’ll attach the recipe for those of you who can’t buy it as a spice mix. Baking the za’atar bread rolls around a ceramic dish is such an easy way to turn this loaf into a showstopper! I should try this with a sweet loaf and a cream cheese dip some day. In a medium pan heat the milk and water to about 37 degrees. When it is warm enough add yeast, sugar, honey and 100g of the flour. Leave this to one side until it is foamy, about 10-15 minutes. Meanwhile beat the oil into the eggs and put the remaining flour and the salt into the bowl of a stand mixer set with a dough hook. Mince garlic and onions and chop the roasted and peeled red bell peppers into fine chunks. (I put the bell peppers on the BBQ until blackened, than let them cool and peeled them under cold water). Fry the white onion and 1 of the red onions in a pan with 1 tbsp of oil. After 10 minutes or so turn up the heat and add the sugar. Let caramelize and add the garlic , the other red onion and the bell pepper. Add the sunflower seeds and the za’atar and let the filling cool down. Once your dough is ready scrape it out of the bowl and cut off a fifth of the dough for the upper ring of the loaf and set aside. Roll the remaining dough into a rectangle of roughly 18in x 10in, with the long edge towards you. Brush the 30 g of softened butter over the dough and then spread the dough with 4/5 of the spiced onion mixture. Roll the dough into a log and cut into 12 equally sized rolls just like with cinnamon rolls. Do the same thing with the leftover dough that you put aside and cut into 15 rolls. Now prepare a baking sheet and arrange your za’atar bread rolls around your ovenproof ceramic dish. Cover with oiled foil and let rise for another 30ish minutes while preheating the oven to 190 Celsius. Brush the za’atar bread rolls with egg wash and sprinkle with poppy seeds and sesame. Let bake for 35 minutes until golden brown. 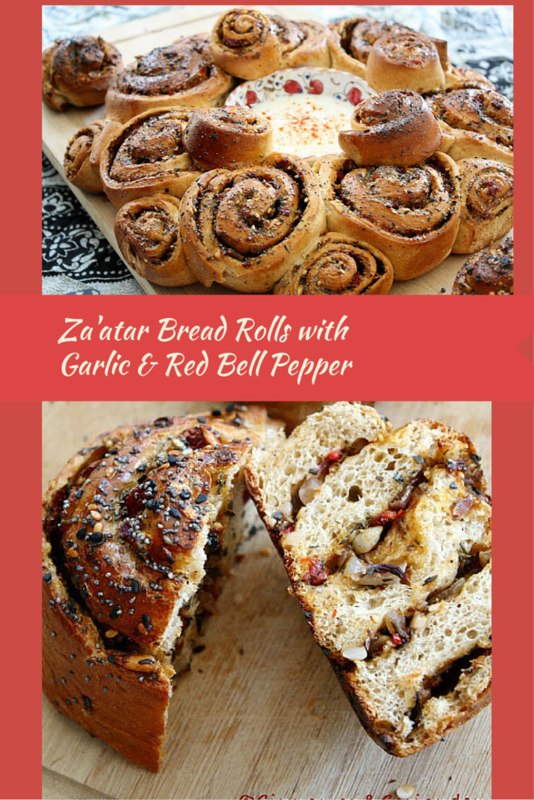 Serve your Middle Eastern Za’atar Bread Rolls with a nice dip! Make sure to let the loaf and the ceramic dish in the middle cool down a bit. Learn from my mistakes!!!! Especially when served with a dairy based dip!! Eure Lieben werden sich darauf stürzen! Ich muss mal dein Rezept kommentieren. Du magst es ja echt würzig. Gestern suchte ich im www nach irgendwas mit Brot aufs Blech und stieß auf dieses Rezept. Ich war Bäcker im ersten Beruf und ich liebe es immer wieder mal etwas besonderes zu probieren, liebe Teige zu kneten, deren Konsistenzen zu beeinflussen und zu optimieren. Und dann noch der Kick mit Gewürzen oder besonderen Füllungen. Und was muss ich sagen: Ich war schon sehr skeptisch gegenüber dem Rezept und vor allem dem Zaatar, aber genau das motivierte und begeisterte mich es auszuprobieren. Ich hatte heute 30 Leute zum Essen. Hier meine Erfahrungen: Das Rezept verdreifachte ich, für 3 Bleche a 16 Schnecken. Den Teig färbte ich mit Curcuma, sah echt mega aus. Anfangs echt klebrig, dann nach erneutem Durchkneten und genug Teigruhe war er echt wie Watte. Ich nahm nur 9 statt 15 Knoblauchzehen, das reichte echt. Und Kümmel nahm ich nur die Hälfte. Sumach kenne ich nicht und fand es auch nicht im besonderen Gewürzregal. Was ist das, beschreib mal den Duft und Geschmack. Als Dip nahm ich 1 kg Schmand mit 1 Bund Radieschen und 4 Äpfel. Beides sehr fein gerieben. Und etwas Zitrone. Der Dip war echt das Sahnehäubchen des ganzen. Zu dem Zaatar: Es riecht sehr eigenartig und nicht gerade lecker, aber im Brot im Ganzen echt genial. Und wirklich gut abgestimmt, sodass kein Gewürz hervorschmeckt. Also es war der Hit heute Abend. Ich werde es wieder backen. Und auf deiner Seite werde ich auch näher schauen, besonders bei den Broten. Bleib beschützt, all diese Köstlichkeiten sind wunderbare Geschenke an uns. Halli Hallo! Zunächst mal entschuldige ich mich für die späte Antwort! Ich war im Urlaub und habe von meiner Familie Internetpause verschrieben bekommen! Das tat auch recht gut! Ich freue mich natürlich außerordentlich, dass das Brot so gut angekommen ist und dass du trotz anfänglicher Skepsis den Sprung ins kalte Wasser gewagt hast! Dass du den Sumach nicht gefunden hast wundert mich wenig!Sumach stammt aus dem östlichen Mittelmeerraum. Mit Salz vermischt ist es In der Türkei ein beliebtes Tischgewürz. In Europa ist die rote Sumachfrucht jedoch noch wenig als Würzmittel bekannt. Dabei ist Sumach eine wunderbare Alternative zu Essig oder Zitronensaft! Versuch es doch mal im türkischen Lebensmittelgeschäft, wenn du ein solches in deiner Nachbarschaft finden kannst! Ich wünsche dir einen schönen Tag!